The following text is an excerpt from a lecture given by Professor Plinio Corrêa de Oliveira on August 16, 1974. It has been translated and adapted for publishing without the author’s revision. –Ed. By possessing nobility of blood and virtue, Saint Francis’ mother, represents a feminine human type that used to exist. These women possessed a spiritual refinement and manners. Thus, their good manners were not just mechanical external gestures and attitudes, but rather the proper expression of the nobility of their souls. Such was Saint Francis’ mother. She was called “the noble” par excellence, because of the nobility of her virtue, blood and manners. This paladin of nobility was called by Providence to form the missionary of South America’s Botucudo Indians. These are the ironies of the designs of Providence. Imagine Saint Francis before these Indians, with their savage countenances and awful odors, never having brushed their teeth. Imagine how often he must have remembered “the noble,” passing through the streets of the capital of the little region of Priego in Spain. When she was pregnant with the future saint, she consecrated him to Saint Francis of Assisi, after whom he was named. Saint Francis Solano’s parents gave him an entirely Catholic formation, which he finished at the Jesuit school in his city. He was a splendid conversationalist and possessed a good bearing, beautiful voice and rare musical sense. Through the influence of its Catholic King, there was a true religious renaissance in Spain that helped compensate for the damage and apostasy that the Church had suffered from the Protestant Revolt. The great Franciscan Saint Peter of Alcantara shone among the figures of this spiritual rebirth. Saint Francis Solano, attracted by the example and prestige of Saint Peter of Alcantara and the Franciscan order, left the Jesuit school and put on the Franciscan habit. Due to his virtue and capacity, he was soon charged with positions of leadership. A defining characteristic of his virtue was that he would not tolerate anyone in his presence to express sadness in serving God. He did not tolerate long wearied faces and did not accept excuses. When someone begins to feel sorry for himself and wear a long face, he enters a road that ends in apostasy. One must serve God happily. Saint Thomas Aquinas spoke of the opposing weariness for holy things and subsequent sadness of living in the service of God. On the other hand, Saint Francis Solano received the grace of communicating joy in doing holy things, a grace so rare and precious in our days, when joy is seen only in the things of the world. The joy he communicated was not the giddy joy of gags or jokes, but the joy of seriousness, the highest and noblest of all joys. Saint Francis Solano exuded this joy wherever he carried out his apostolate. He was always happy and enthusiastic, whether fighting spiritual battles, suffering or contemplating. When traveling, he always carried a violin, which was his great instrument of apostolate, together with his discipline and cilice. This combination explains a lot about Saint Francis. Had he brought the violin without the cilice, he would have been on the road to apostasy; but without the violin, the cilice would lose some of its meaning, because the proper use of a cilice makes one joyful. Similarly, a soldier going to fight must go happily. Only a worthless soldier would go to war weeping and saying: “O dear country, how it pains me to leave you…O my dear family. What grief! Poor comrades who may die in battle.” The beauty of a soldier shines when he happily sacrifices himself and joyfully marches towards danger and death. This is also how religious should be. They should joyfully carry responsibility, face their vows and belong entirely to Our Lady. They should enjoy the happiness of one who possesses everything because he has nothing. The violin and the cilice – this is so magnificent a combination that it could fittingly decorate a South American Chapel, in remembrance of this apostle. When he would become really enthusiastic, he would play the violin, sing and dance before the statue, or even before the Blessed Sacrament. In the Cathedral of Seville, the young sacristans and acolytes traditionally dance the minuet before the Blessed Sacrament. Obviously, Saint Francis would dance something less frivolous than the minuet. From a certain perspective, being indifferent to it would be worse than being indignant. Dante placed those souls who were incapable of either love or hatred outside of Hell, because he felt they were unworthy to enter. Next, the author explains that Saint Francis was zealous for the Sacred Liturgy. He diligently insisted that all the brothers learn the rubrics and liturgical songs well, to give the maximum glory to the Sacred Mysteries. However, he would also sing and play popular music to please the people. This demonstrates his capacity to appreciate harmonic contrasts. He would play popular religious songs to please the people, but also could diligently demand a high appreciation and understanding for the superior beauty, theological thought and all the pious and supernatural aspects of the liturgy. His spirit was so grand that it embraced both and was capable of enthusiasm for extreme, though not contradictory opposites. He would often pass through the streets of Spain, playing his violin. The children would run after him. Then he would stop playing and give them a little catechism class. These classes must have filled the children’s souls. He would give the older ones a sermon in which he would condemn the bad customs and habits of the time and strive to instill virtue in them. Understanding their innocent candor, he knew they would repeat what he said to everyone they saw. Thus, he would speak to the whole population of the town, through the children. This is how he fought the widespread Renaissance habits of his time. He was truly an excellent apostle. His superiors decided to send him, at his request, to America. He was becoming quite famous in Spain and wanted to move. He then began to travel throughout Latin America on foot. He traveled in Panama, Colombia, Paraguay and Bolivia. Saint Francis went as far as Paraguay, traveled into Argentina and ended up in the city of Tucumán where he did apostolate. The stretch between Panama and Tucumán would be enough to make an ordinary pioneer famous. However, since Saint Francis made the journey for the love of Our Lord, he is much less known. He spent a good part of his life in Lima, called the City of the Holy Kings, where the Franciscan order flourished with 180 members. At that time, their virtue was so great that Lima became famous among the Franciscans of Europe. While he stayed in Lima, Saint Turibio of Mongrovejo was Archbishop and Saint Rose of Lima was just beginning her life of sanctity. After a stay in Lima, his virtues began to gain him prestige and important offices; so he fled. His attitude is so different from that of modern politicians. Saint Bernard said that glory is like a shadow, when a man flees from it, it comes after him, but when a man chases it, it runs away. In the region of Tucumán, he sought after the most dreadful Indians. At a certain point in his travels, he became tired, having made a long journey through the thick of the forest. When perceiving a stranger, the Indians would often become suspicious and follow him a long time to see where he was going. Then, they would kill him. Since he was thirsty, he stopped close to a spring and bent down to get a drink. The scene is very beautiful. In the midst of a virgin forest, a Franciscan friar wearing his habit, stops at a bubbling stream to drink water. He makes the sign of the cross and drinks the water. Afterwards, he sits down and rests a bit. He hears numerous birds singing in the forest and the murmur of running water. Since he is a musical genius, he decides to accompany these sounds with his violin. He is deep within Indian territory and knows that he can be killed at any moment. Nevertheless, he calmly continues to play music and rest. This is the advantage of having a clear conscience! He realizes that he could die in the midst of his music, but knows that he would go to Heaven. He would enter Heaven, playing music and the angels would be enchanted. Suddenly, an arrow flies by one of his ears and sticks into a tree. It is merely a warning. The Indians’ aim is flawless. They do this to frighten their victim before killing him. Saint Francis continues to play. In the midst of his music, he sees an Indian face emerge from the vegetation. It is the chief of the ferocious tribe he is seeking. He sets down his violin and, inflamed with the love of God, embraces the Indian. The Indian is moved and allows him to continue playing his violin, rather than killing him. He then brings the friar to his tribe and Saint Francis begins to evangelize them. Thus begins this tribe’s conversion. This story is beautiful. It would fit perfectly in the Fioretti.2 It could even be the subject of a medieval illumination. However, his work had just begun. He still had to speak to the Indians. Since he did not know their language, he spoke to them in Spanish. He very nonchalantly explains that he was then given the gift of tongues so that the Indians understood his Spanish! He spent the next thirteen years in this region, tirelessly working to make peace between the whites and the Indians, resolving disputes and winning both for the Faith. Saint Francis Solano, like Saint Francis Xavier, raised the dead, cured fatal illnesses, tamed fierce animals and irrigated dry lands. Thus, Indian and white man alike venerated him. At one point, a swarm of grasshoppers was devastating a plot of land that had been planted by the Indians and the saint ordered them to flee to a neighboring forest. He simply commanded them to leave and they left. When the settlers asked him why he did not exterminate the grasshoppers, he gave them two reasons: first, because grasshoppers had sustained Saint John the Baptist in the desert. Second, because the Indians also ate the grasshoppers and he did not want his brother Indians to be deprived of their food. This man who was so extraordinarily gentle, was also immensely austere. We have already spoken of his violin, but not of his cilice. According to his biography, he was not only chaste, but it was the only virtue that he allowed others to see that he had. He never allowed a woman to get within one hundred paces in any direction of his dwelling. At the time of his death, he ordered the construction of a cottage alongside the choir of the Church, so he could always be in the presence of the Blessed Sacrament. When he was unable to do so, he brought a mat to the choir where he laid himself down. After a few moments of rest, he was inflamed with the love of God and he began one of his famous songs and dances, accompanied by the violin. He was just about to die. To express his love of and gratitude to the Sacred Virgin, he sang the Magnificat in his last moments. Since he was a missionary, that is a propagator of the Faith, he also sang the Creed. He died precisely at the moment he sang: “Et incarnatus est ex Maria Virgine.” At the same time, the bells of the convent were announcing the moment of the elevation of the Sacred Host in the Conventual Mass. It all happened at the same time. It could not be more beautiful. In the convent, the bells were ringing for the elevation, while he was singing the Creed. When he arrived at the words quoted above, his holy soul rose to Heaven. On one hand it was a death, on the other it was a birth. After his death, his body, which had been so mistreated during his life with fasting and penances, was miraculously rejuvenated. A doctor came to examine the body and certify the miracle. When he tried to touch one of the saint’s legs, it recoiled from him. That is why his body was represented with one leg bent in the retreat that was made on the day after his burial. He worked yet another miracle. His dead body recoiled to show how much God loved him in life. He who had raised many from the dead, gave this manifestation of life. The viceroy was away from the city. He ordered the burial to be postponed so he could be present. The viceroy as well as the Archbishop entered the funeral cortege and humbly kissed the saint’s feet. When the viceroy noticed that the pillow supporting the saint’s head in the casket was made from a very ordinary fabric, he switched it for a velvet one with golden embroidery. He took the original one with him and kept it as a relic. 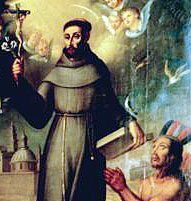 Saint Francis Solano was beatified in 1675 and canonized in 1726. Even before his beatification, he was already chosen as the patron of the cities of Lima, Buenos Aires, Cartegna in Colombia, Panama and Santiago in Chile. With this, the beautiful story of Saint Francis Solano is over. This can in no way be seen as a justification for the modern progressive liturgical dance movement. St. Francis’ dance was the expression of an intense love of God and was never done during the liturgy. –Ed. This is the name given to the famous collection of marvelous stories about Saint Francis of Assisi, in English titled: The Flowers of Saint Francis. –Ed. This entry was posted in Plinio Corrêa de Oliveira and tagged a, but, contemplating, enthusiastic, Feminine, Fransican order, great, happy, is, man, Montilla, nobility, passage, Prof Plinio, raised, reflections, Saint, Saint Francis Solano, Spanish Counter-Reformation, suffering, the, virtues by Plinio Corrêa de Oliveira. Bookmark the permalink.